To provide patients with convenient and affordable care with the goal of improving the health of our community. Every day of the week, we are here to help you with General Medical Care, X-Rays, Labs, Vaccines, Physicals, Occupational Medicine, and Flu Shots. 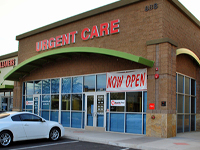 We provide urgent care services to residents of Gilbert, Mesa, Chandler, Queencreek and surrounding communities. Intravenous – Antibiotics, fluids, pain and nausea medication, etc. Excellent, qualified and compassionate providers and staff. No appointment is needed. Short wait times.